It’s no secret that keeping your online reputation positive has a direct impact on the success of your business. 92% of consumers read online reviews before choosing a business. So what do you do when someone decides to leave you negative feedback? First, consider if the feedback is a genuine complaint that could help you identify a flaw in your service or product. The customer is not always right but you should take what is being said to heart and respond in a professional, calm manner. Avoid being confrontational or defensive! You can prevent losing the customer by suggesting they contact customer service and assure them to make things right whatever the complaint was about. Once they contact you directly, you can ask them to kindly delete or edit their online review. If you can prove that the reviewer is a business competitor or simply a fake reviewer, you can reach out to the website where the feedback was posted and ask them to delete it. You can flag reviews on Google as inappropriate and provide a reason why you want the content to be removed. This is not a sure bet by any means so do not fall for scam businesses advertising that they guarantee to delete bad reviews. The only thing they’ll delete is money from your bank account. 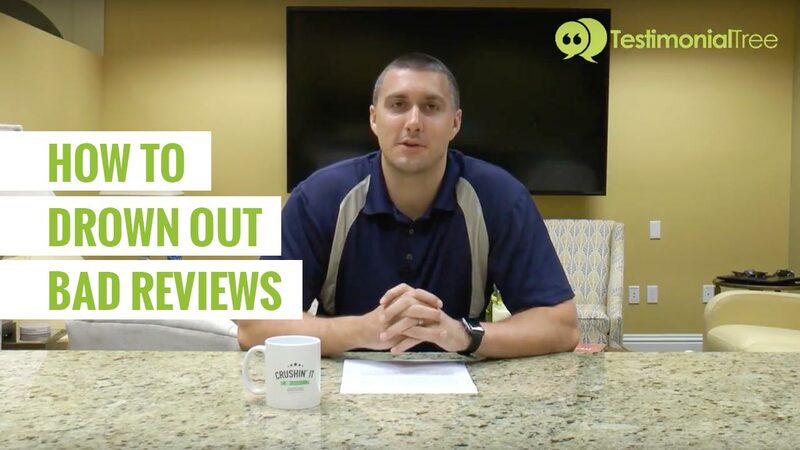 The best way to drown out bad reviews is to outweigh them with positive review. You should follow up with each customer and ask them to give you feedback. The more positive reviews you gather the more that one negative review will seem insignificant and will get lost in the overwhelming positive feedback. Automated feedback request software such as Testimonial Tree makes it easy for you to follow up with customers without adding any work to your plate. It even lets you filter out negative feedback before it gets posted on the world wide web. Bottom line is that you do great work so don’t be shy to ask for a testimonial! 68% of consumers said they would leave feedback for a business if asked. So all you have to do is ask! Check out this blog post that has tips on how to ask for a testimonial. There’s also a free downloadable sign you can post in your office to let customers know they’ll be getting a feedback request from you.